The Sourwood Festival takes place this weekend in Black Mountain. The street festival, now in its 30th year, brings 180 vendors and what estimators are saying will be 30,000 visitors to the town. The Sourwood Festival is a wonderful showcase of mountain arts and crafts, music and food. And there isn’t a better place to have it than in Black Mountain, considered the “Front Porch of Western North Carolina” for good reason. It’s one of those charming small towns that you want to visit again and again. The festival goes from 10am to 9pm on Saturday, August 11, and from 10am to 6pm on Sunday, August 12. So, what’s sourwood, you ask? It’s a beautiful tree native to the eastern United States and it thrives here in the mountains of Western North Carolina. Sourwood trees are short and slow-growing and are often used as ornamental trees. 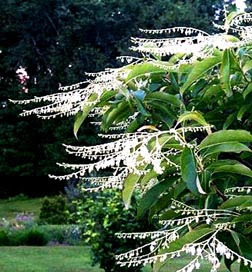 White bell-shaped flowers appear on the sourwood trees in the summer, bees pollinate them — and voila — prized sourwood honey is produced. Sourwood honey is, of course, available at the festival. In Autumn, the leaves of sourwood trees turn a striking red, adding to our fantastic fall foliage. An article about the Sourwood Festival can be read at the online home of Black Mountain News. This entry was posted in Uncategorized and tagged art, Black Mountain, festivals and special events, flora and fauna, food and drink, shopping by Inn on Mill Creek. Bookmark the permalink.